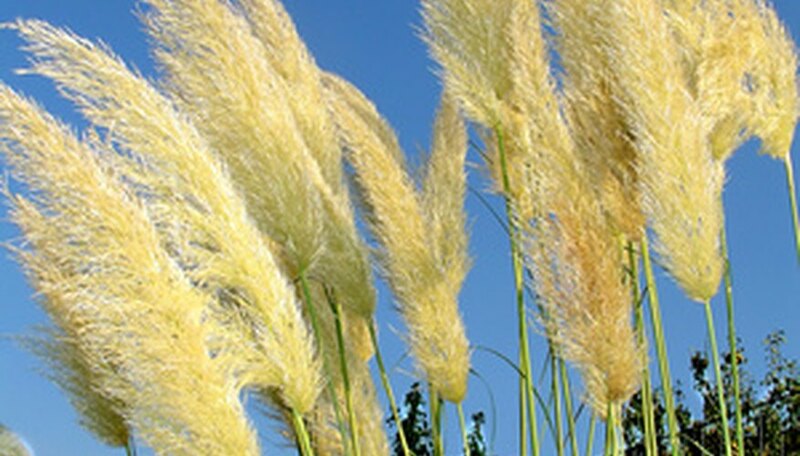 Pampas grass is an ornamental grass that produces large, decorative seed pods that look like the spray of a fountain when they disperse their seeds. The grass can appear exotic when it is first planted, but in the warm climates of the south and west, it can grow enormous and become invasive. If you want to remove pampas grass from your lawn, you can dig the grass up if it is small. But large clumps of pampas grass must be pulled out of the ground. Treat pampas grass with a broad spectrum herbicide that contains glysophate. Allow the plant to die so that roots will easily release from the soil. Pampas grass blades will turn brittle and brown when the grass dies. Wrap the sheaf of grass with a piece of rope. The rope will help to hold the grass sheaf closed and help prevent the grass blades from cutting your skin if you come in contact with them. Insert a shovel into the ground approximately 12 inches away from the sheaf of small pampas grass bundles. Work the shovel completely around the grass. Then slide the shovel under the grass and lift to remove the bundle from the ground. Rent a truck with a winch attachment from an equipment store. This is a less labor- intensive method of removing large clumps pampas grass than digging. Wrap a winch cord around the base of a sheaf of pampas grass, and attach the hook on the end of the winch to the rope. Water the soil around the pampas grass to loosen it. This will make the grass pull up from the soil easier. Activate the winch and allow it to pull the bundle of pampas grass out of the ground.